I’m very appreciative to attend this workshop at the Brentwood Arts Exchange, which is one of several workshops in this series. Hope to share some findings later on today! For more information, visit arts.pgparks.com. Your art is unique and creative and your own. Learn how to ensure that it stays that way by attending a workshop on artists’ copyright issues. The Brentwood Arts Exchange in partnership with the Gateway CDC presents a series of 5 professional development workshops for visual artists. Topics include tips on marketing art work, navigating copyright issues, pricing, and improving your portfolio presentations. All workshops are free and open to the public. Presented in partnership with the Gateway CDC and the Prince George’s Arts & Humanities Council. It’s a festive evening tonight at the Prince George’s African American Museum and Cultural Center’s Gallery 110! The reception, at Gallery 110 and at the Brentwood Arts Exchange at Gateway Arts Center, is full of people. The exhibition features the four incorporated towns of Prince George’s County, North Brentwood, Eagle Harbor, Fairmount Heights, and Glenarden. The reception will open to the public at 7pm, please come on out! For more information, go to PGAAMCC’s website. Looking for Holiday presents? 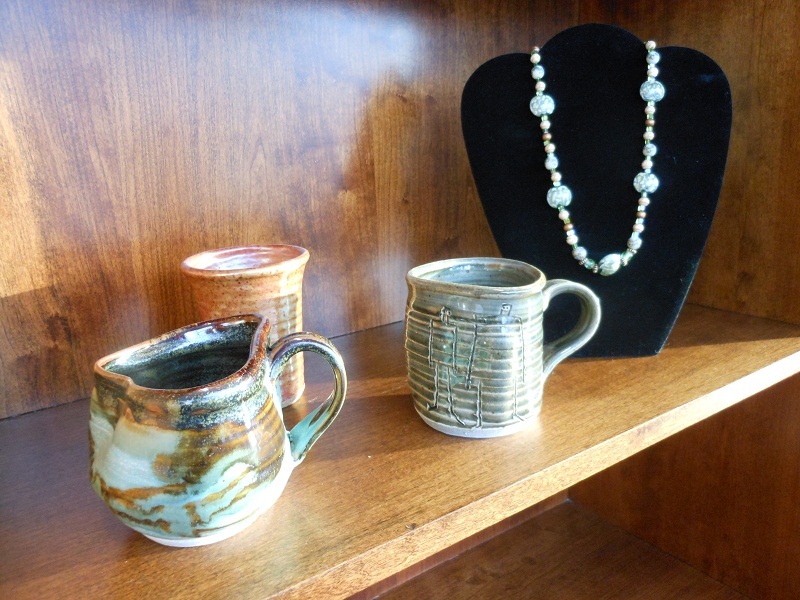 Visit the Brentwood Arts Exchange’s Craft Store! As I’ve said before and will say again, the items here are unique, fashionable, and inexpensive (for the most part). If you want to buy something for a loved one that isn’t from Bed, Bath, and Beyond or from Target, the Brentwood Arts Exchange sells jewelry, pottery (vases, bakeware, dinnerware, etc. ), artistic storage boxes, scarves, prints, paintings, sculpture, and more. As part of the Prince George’s Department of Parks and Recreation, Arts and Cultural Heritage Division, the Brentwood Arts Exchange works to support local artists and artisans. We feature a craft showcase with affordable fine craft and art works, including textiles, glass, ceramics, metalwork, jewelry, encaustic, and more. 75% of the sales price of works sold goes directly to the artists. 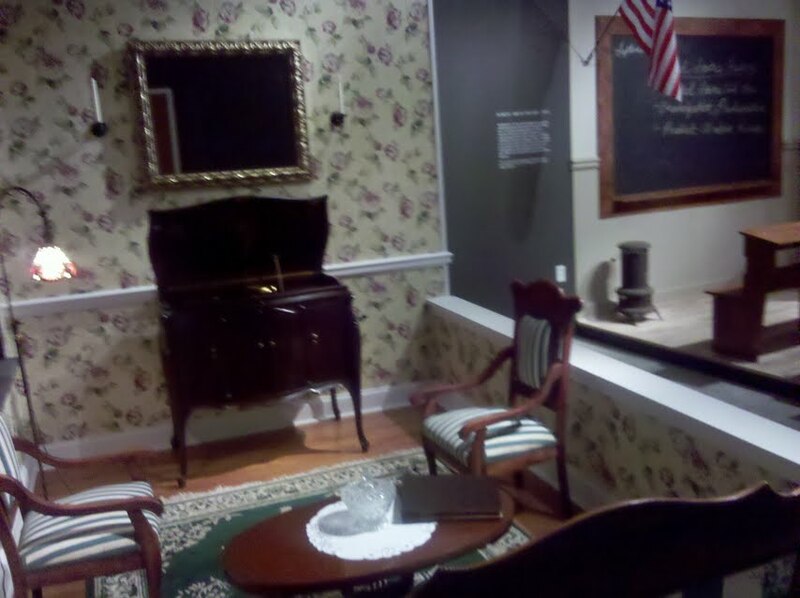 This week is your LAST CHANCE to see the Prince George’s African American Museum & Cultural Center’s “Coming Home” exhibit at their Gallery 110 space in the Gateway Arts Center. It’s worth checking out! View my original post here. The museum is open 10am-5pm Tu-Fri and Saturday 10am-5pm. For more info, visit www.pgaamcc.org. Also, at the Gateway Arts Center this Saturday, the Brentwood Arts Exchange is having its opening reception for the 2011 Prince George’s Juried Exhibition, “The Sky’s The Limit” from 5-8pm, the 39th St Gallery is having its opening reception “Trade”, and “Hello, Mosaics by Liza Linder” exhibits in the 39th St Corridor. It’s all from 5-8pm! Don’t miss out! Find out more about the Brentwood Arts Exchange’s Artistif Reflections on our Upcoming Blog Post, here. And you can find more information on the 39th St. Gallery at www.39thstreetgallery.org/! I also found a great post on Migrations written by Krysta Schlyer on The Borderlands Project blog. Please stop by the Brentwood Arts Exchange at Gateway Arts Center to experience their latest exhibit, Artistic Reflections, now on display until August 13th. I’ve fallen entranced by Sylvia Snowden’s Malik, Farewell ’til we meet again and David C. Driskell’s Dancing Angel, just to name two awesome works of art. Find out more here! I just came across a behind-the-scenes blog from one of the artists behind “Big Ideas”, Ellyn Weiss! For days now I’ve been cultivated at work, sitting and churning over the wide array of fun, must-not-touch, must-get-up-and-jump-for-joy artwork—and today, I know a bit behind the process. We began meeting weekly to try to approach some common vision of the installation. There was lots of coffee and talk, some conceptual drawings, the sharing of references to the work of some favorite artists, but still the lingering doubt that we were each actually “seeing” the same thing in our mind’s eyes, or if we were seeing anything concrete enough to execute at all. After some 6 weeks or so of this, we reached a fateful decision; we would stop trying to plan it all in advance and begin to play together with various materials, hoping that a more concrete shared vision would emerge in this way. We learned that we share an affinity for materials with a sort of arcane industrial look that seem well used and aged. We were inspired by Community Forklift in Hyattsville, where renovators donate salvaged building materials from nails to sinks and they are sold at bargain prices to be recycled. Community Forklift not only provided us with our initial art materials, it embodies the spirit of renewal, re-use and rebirth of the Gateway District that we try to reflect in Community Spirit. Big Ideas has its opening reception THIS SATURDAY from 5pm-8pm at the Brentwood Arts Exchange @ Gateway Arts Center. I’ll be there, I hope you can stop by! I’m proud to let you know about Resonant Forms at the Gateway Arts Center in Brentwood, MD. Presented by Brentwood Arts Exchange and the Prince Georges African American Museum and Cultural Center, the exhibit opened thisFebruaryfor Black History Month and will be open until April 9th! The opening reception is Friday the 11th from 5pm-8pm. As some of my friends and readers may know, Ill be starting as an administrative assistant at the Brentwood Arts Exchange on Monday!That means I had the opportunity to see the show just a day after it opened last Wednesday, and I can tell you that the works are just mesmerizing! I can tell you now: The exhibits so full of energy! Its a celebration of life and exploration by three amazing artists:Martha Jackson-Jarvis, Alonzo Davis, and Frank Smith. I had the opportunity to meet Alonzo Davis back in November when I posted a series of photos from an exhibit of his at the Spotlight Cafe just up the street in Mt. Rainier. I could spend hours just figuring out the different materials he finds and creates to make the marks and forms that describe his bamboo sculptures. Speaking of figuring things out, I found myself on the floor crawling around Martha Jackson-Jarviss sculptures looking at every nook and cranny as I tried to see things from the floor from their perspective. I sort of want to hug his works, not because they look cuddly or anything, but because I too could be crawling on the ground with them. Its like a jungle of color and texture in the gallery, Ill be hopping from the floor and climbing on the walls and up the cieling! Its all to easy to find my eyes tracing the beautiful collage canvases of Frank Smith, whose works reflect jazz and hip-hoppery in their meaning. Its these sewn with beats and blues type works that get the heart and mind rolling! You can see earthy tones in Davis and Smiths works, but with Martha Jackson-Jarviss works I found myself mesmerized at her paintings. I see the sky and the earth when I look at them. I suppose they remind me of the power and spirit that a great abstract painting can give to the viewer. Im really looking forward to reading through the collection book on Monday. Id love to see how these three artists were chosen as their works complement the space and one another so well. The exhibits opening reception is Friday the 11th at 5pm-8pm! Will I see you? Ill be there early on!